Sterile area validation has different tests like air supply, air velocity, air changes, flow pattern, filter integrity, pressure test, particle count, temperature, recovery test, microbial count, relative humidity, noise level and vibration test. Sterile area qualification and HVAC system qualification are two different things but most of the tests are same because HVAC system is qualified by its performance as the quality of the area. Qualification document of the HVAC system and the sterile area should be prepared separately. The sterile area can be qualified by applying following tests. Measure air velocity at the filter face using a calibrated anemometer. Measure at numerous sites to provide one measurement for every 0.37 m2 filter area. For LAF air flows uniformity to be 0.45 m/sec ± 20%. For other filters, airflow will be checked and ensure that airflow shall not exceed filter rating and uniformity shall not exceed designed specification. There is no minimum GMP requirement for air changes per hour. Airflow into and out of a space should be based on providing the required cooling, heating, relative humidity, pressurization, particulate control, dilution ventilation, recovery time from an upset (spill or dust emission) condition. These factors generally result in air change rates of between 4 and 20. However, higher rates have also been used successfully. An adequate number of fresh air quantity (as per designed) will demonstrate at the time qualification of the HVAC facility. In the microbiological area in QC department, a minimum 20-air changes will be maintained with 15 Pascal pressure differentials to the adjacent area. Visualise the air patterns at numerous points in the room using smock generate or Titanium Tetrachloride sticks. Smock should flow from “clean” area to “ less clean” area quickly and smoothly. To check the interference due to turbulence eddies in unidirectional airflow area, like sampling booth, dispensing booth and under laminar airflow in the microbiological area. This test is used to check that there is no the dead space in the critical area. All HEPA filter installed in the facility will test for filter integrity test and filter leak test at the At-Rest Phase by using PAO (Poly-alpha-olefin) aerosol into supply duct to the HEPA filter. The following test will be allowed to demonstrate the filter integrity and leak test. Measure the “normal” upstream particulate challenge to HEPA filter using particle counter. Scan the filter face and seals with particle counter for the leak test. Not more than 3% area of the filter should not be repaired by the sealant. There is no quantified (numerical) requirement for relative pressurization (accept microbiological lab in QC area). The velocity and direction of airflow between spaces should be adequate to reduce the counter flow of airborne particulates or vapor contaminants for spaces where airborne cross-contamination is a concern. In general, relative pressurization shall be set up to reduce airborne particulates and vapors from passing from an open Level 3 Protection processing space to another incompatible Level 3 Protection space. Conversely, pressurization should be set up to reduce airborne particulates from passing from the outdoors, above ceilings, mechanical or similar spaces and from Level 1 Protection spaces to Level 3 Protection processing spaces. Airlocks or buffer zones are used to separate production areas from adjacent common corridor/staging areas, non- classified areas. To provide protection, when the doors are closed, room pressure shall be demonstrably positive or negative. Airlocks or buffer zones will provide additional protection if only one door is open at a time. Pressured airlocks may have either positive or negative relative pressure, depending on what is best for the particular situation. Airflow variations from dust collecting, vacuum or process systems and their effect on space pressurization shall be demonstrated for in the operation of the HVAC system. Prior to air balancing, rooms shall be inspected for obvious leakage and for architectural integrity. Leakage may have a significant effect on the room air balance and/or upon the ability for particulates to enter or leave the space. Operate the HVAC system of the sterile area and release smoke into the unidirectional air stream at selected sites. Measure the deviation of smoke stream from vertical or horizontal over 90 cm from the flow path. To demonstrate that deviation in parallelism airflow shall not greater than 14º. There are no particulate classification requirements for OSD facilities such as those that exist for aseptic processing. Cross-contamination can originate from both the internal environment and outside the OSD facility. In all air handling systems, the filtration should be evaluated for the adequate assistance of outdoor particulates. The HVAC system was designed to demonstrate the Class - D requirement At Rest or As-Built level and it will demonstrate at time qualification activities of HVAC system. Select any suitable particle counter instrument and set it at an air flow rate of 1 cubic feet per minute, carry out the particle count at minimum 10 different locations in the room which are representative of the room for one minute at each location at 3 feet height from the floor. It must cover the central location of personal traffic. Note down the number of particles of size equal to 0.5 microns and larger and number of particles of size equal to 5 microns and larger at each designated location. Room temperature may be a critical parameter for both open and closed operations. Most products, materials and processes can handle a wide range in temperature. However, the width of this range decreases as the exposure time increases. For example, the contents of a large processing vessel would typically not change temperature measurably during typical sampling activities. If product or material is stored or exposed for significant periods, however, (such as in a non-temperature controlled blender) then significant effects may occur. Personnel consideration in temperature consideration: The USP excursion limits for finished product storage are 59°F - 86°F (15°C - 30°C) with a customary CRT (Controlled Room Temperature) working environment of 68°F - 77°F (20°C - 25°C) and a maximum MRT (Mean Kinetic Temperature) of 77°F (25°C). Existing HVAC system had designed for 24 ± 2°C to all critical area in manufacturing, warehouse and Quality Control department. Process related consideration in temperature specification: In some area due to the presence of heat generated equipment the temperature efficiency will be demonstrated in the compliances of the designed criteria at the time of the qualification exercise. In some product, in-processing temperature requirement shall be maintained and demonstrated 18°C ± 2°C. Actual product temperature monitoring (whenever required) will be performed instead of room temperature monitoring. Exhaust Consideration in Temperature Specification: Wherever the exhaust of the large quantity of the air from the critical area requires a large volume of makeup air to be introduced into the in-process area to replace it. This replaces air shall be conditioned prior to introduction in the in-process area. Air Flow Pattern Consideration in Temperature Specifications: In the mixed airflow critical area, a pocket of stagnant air may develop. Temperature gradients in excess of those specified can result, air inlet and outlet are not properly spaced. Proper mixing of conditioned air with re-circulated air and effective airflow pattern is required to demonstrate the specified zoning temperature. Measure the particle counts at room air return outlets and establish “At rest” level. Generate the smoke at air inlets to room until particle counts at outlet is high and constant and switch of the smoke generator. Record the particle counts each minute until counts return “At Rest” level. Testing will be performed for a period of one year routine production in accordance with the sampling plan. Sampling will be performed in accordance with the procedures detailed in Validation Protocol for sterile area. The testing regime for the Environmental Monitoring will be defined in Validation Protocol. Throughout the Performance Qualification period regular project team meetings will be held to discuss the testing results. Should any failures occur during the Operation Qualification stage additional samples will be taken to ascertain the cause and extent of the contamination. Corrective action will be instigated on a case-by-case basis. Following the Standard Operating Procedure for microbiological evaluation of microbiology laboratory, and Procedure for microbiological evaluation of manufacturing area will do microbiological evaluation of the critical area of the facility. Air Active Sampling: following the procedure described in the Validation Protocol for HVAC System in sterile area will do Active sampling. Defining the location of sampling in the protocol will do sampling and minimum 1 cubic litre air will be taken from each location. Average total viable count per cubic meter of air should comply with fallowing alert and action level to define in the validation protocol. Incubation of the media for bacteria and fungi evaluation will be done up to required time period and at defined temperatures. A positive and negative control test will be conducted to confirm that adequate test procedure has been fallowed. Air Passive Sampling: following the procedure described in the Validation Protocol for HVAC System will do passive sampling. Exposure of 90 mm settle plates will be done for 4 hours by defined the location of sampling in the validation protocol will do sampling. Average total viable count per plate for 4 hours of air should comply with fallowing alert and action level to define in the validation protocol. Surface sampling: Surface sampling will be conducted by using the swab or contact plat, collecting the microbiological contamination from approximately 25 cm2 surface from at numerous defined locations in the Validation Protocol for HVAC System in sterile area. Average total viable count should comply with alert and action limits defined in the validation protocol for sterile area. Room relative humidity (RH) may affect exposed product or materials that are sensitive to air moisture. RH levels generally have negligible effect on aqueous product. 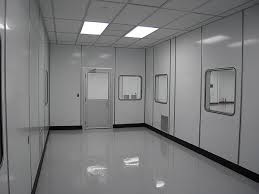 However, liquid product can lose moisture to a low humidity room over an extended period. HVAC system in sterile area had designed to maintained the humidity Not more than 55% Humidity level will be maintained wherever product comes in the direct contact of the product. A cooling coil type of dehumidification will be applied for maintaining the humidity in the required area. Using drain tray and pipeline to make assure not to stagnant water in AHU will drain the condensed water out. Relative humidity will be checked by using calibrated humidity meter from different location of Classified, Unclassified area as defined in the Validation Protocol for sterile area. Humidity should not more than defined alert and action limits in validation protocol for sterile area. High level of noise may be present in the facility due to operation of the variety of equipment like high static exhaust fan, vacuum pump, centrifugal pump etc. OSHA requires hearing conversation program when personnel noise exposure exceed an eight hours time weighed average sound level of 85 dBa. HVAC system has designed not to generate more than 70 dBa noises in critical area during its normal operation. Noise level will be check by using calibrated Octave Band analyser or any other similar equipment and measure the noise levels at defined location to confirm the that noise level is within limits as defined in the validation protocol for sterile area. The HVAC system of the facility has design to generate a minimum vibration during it full-scale operation. Vibration level generate by HVAC system will be checked by using calibrated accelerometer or any other similar equipment and measure the vibration levels at defined location to confirm the that vibration level is within limits as defined in the validation protocol.